I have spent the past 55 years fishing in the Eastern Sierra. 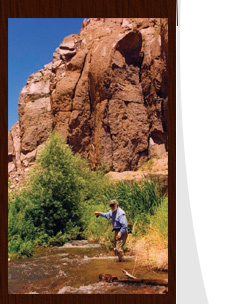 For the past 25 years I was the owner of Brock’s Flyfishing Specialists in Bishop California. I had the opportunity to sell Brock’s in late 2013 so that I could dedicate my time to fishing, guiding and teaching fly fishing. As a licensed, bonded and Certified Federation of Fly Fishers Casting Instructor, I am proud to offer expert guide service and am familiar with all of the waters, which run from high mountain lakes and streams to prime tail-water fisheries in the Eastern Sierra. Bishop Flyfishing Guide Service is a year-round full service flyfishing guide service in Bishop California. 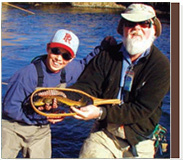 We offer flyfishing lessons, flyfishing classes, flyfishing seminars and guided flyfishing trips. As a certified casting instructor of the Federation of Fly Fishers and professional flyfishng guide, I specialize in teaching flyfishing to the beginner. I also offer individual and class instructions for the beginner, intermediate, and experienced flyfisherman. Additionally I offer a 4-hour introductory class to fly fishing, that is personalized to the angler, as well as offer scheduled in-depth seminars throughout the year. All classes are geared to teach you the basics of tail-water fisheries, highlighting the Lower Owens River as our classroom. In-depth specialized instruction is also available.